Author LCPublished on August 14, 2013 1 Comment on II Corinthians 1:4 Why? So, punishment for sin is not the answer, but hardships do still serve a purpose. First of all, this life is temporary. If life were easy, we would either be content to stay here for the rest of time, or we would have no incentive to focus on what matters for eternity. God wants us to realize that the important things are not the temporal, worldly things that we spend so much time and energy on. Sometimes it takes a tragedy to help us see what matters. Suffering also leads us to depend on God instead of our own strength and resources. We are humbled when we realize that we can’t manage everything on our own. When we are humble we can be pleasing and useful to God. (Psalm 51:17) God can work through us, and we can bring glory to Him. An additional purpose for our suffering is outlined by the Apostle Paul in II Corinthians 1:3-4. Our trials give us the experiences we need in order to know how to comfort others who will go through similar struggles. Biblical comfort is not sympathy, but strength, not a way out of the problem, but a way through it. Our trials help us to understand what others are going through. I know of many people who have gone through unimaginable tragedy, but because of it have started organizations to help others who find themselves in similar situations. Many have testified that they have found their life purpose through the tragedy they endured. Published on August 14, 2013 Categories Grace, TrialsTags comfort, grace, hardship, II Corinthians, strength, trials1 Comment on II Corinthians 1:4 Why? You've probably seen Santa Claus; but have you ever seen the Easter Bunny? As a small child, I enjoyed visiting Santa at a local department store at Christmastime. My parents would take me downtown to the jolly bearded man in the red suit. I felt comfortable climbing into his lap, telling him my wish list and receiving a gift along with his encouraging words. He was friendly, predictable and safe. Imagine my excitement when one Spring I learned that the Easter Bunny would be at the same department store. Neither my family nor I had ever seen the Easter Bunny. I had seen white rabbits. Those cute, cuddly little bunnies seemed so warm and innocent. I looked forward for some time to seeing the real Easter Bunny. Finally, the big day came. My father took me to the store that afternoon. When we reached the Bunny's floor, I was shocked. Before me was a human-sized hare with big eyes and large, floppy ears. The creature walked on two legs like a human. He talked. The more clearly I saw him as I approached him, the more slowly I walked. I would not get close to the furry beast. He wanted to give me a gift, but I was not cooperating. "Just throw it to me," I suggested. He tossed his present across the room, Frisbee-style. Much as I was confused about the Easter Bunny, many folks are confused about the meaning of Easter itself. For some, it means new clothes and a chance to show them off. Others focus on eggs, candy and special meals. Spring Break is a highlight of the season. The beach beckons and relaxing on the sand or reveling at parties defines the holiday. Easter is also billed as a time of renewal. It may be relatively easy to renew things outwardly -- new clothes, a hairstyle, a fancy party. Renewal on the inside can be more difficult. Problems from the past can haunt one's memory. Broken relationships undermine self-esteem. Guilt over missed opportunities, pain from rejection, loneliness and anger from past hurts can sometimes create a swirling inner vortex, a psychological suction from which escape is difficult. Where does one find inner renewal? Some look to friends or family. Counselors and self-help books provide coping skills. But maybe a look at the first Easter could also offer some clues. Nearly two millennia ago, a young Jewish leader fell into disfavor with established authorities. He was executed, declared dead, wrapped up like a mummy and placed in a tomb. A large stone was rolled against the tomb's entrance and an elite unit of Roman soldiers guarded the tomb against grave robbers. Two days later, the stone was rolled away and the tomb was empty, but the grave clothes were still in place. The man's closest followers, most of whom had abandoned him during his trials, reported seeing him alive again. Many later died horrible deaths for telling people that their leader had risen from the dead. Sometimes life's challenges can seem as scary as that huge hare seemed to me when I was a child. We don't want to get near them. Yet that first Easter still offers hope. Maybe if Jesus really did come back from the dead, then people today can find inner renewal by knowing him personally. As we enjoy eggs and rabbits this Spring, might that be a message worth pondering? I love to listen to people give their testimonies and to hear how their lives have significantly changed because they have given their hearts to Jesus. Some of them recount pretty dramatic transformations—conversion from a life of crime, freedom from drug or alcohol abuse or other harmful ways of living. For some, they found freedom from their old desires the instant they accepted Jesus. Sometimes people have changed their entire focus in life, from being high finance, career-oriented business people to becoming missionaries for the poorest of the poor in Haiti or sub-Saharan Africa. 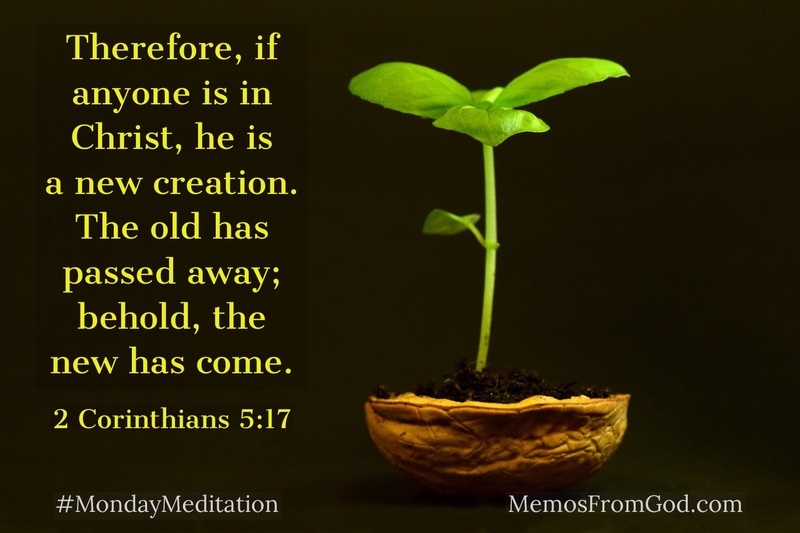 II Corinthians 5:17 tells us that if we are in Christ, we are a new creation—the old has gone; the new has come. Of course, such remarkable changes as the examples listed above are not always evident in every person who becomes a follower of Christ. For one thing, they may not have found themselves in such a dramatic position to begin with. Some of us work at putting our old habits behind us every single day. And very often we feel like we have failed because we keep fighting the same battle over and over again. Contrary to what some people imagine, life doesn’t become sweet and easy just because you decide to follow Jesus. As a matter of fact, sometimes it gets a lot harder because Satan gets a little upset when we change sides. So we will always have the battles to face. (John 16:33) The good news is that God isn’t surprised at our imperfections. He already knows all about them, and He doesn’t condemn us. (Romans 8:1) Jesus took all the punishment for all of those imperfections when He sacrificed Himself on the cross. Our penalty has been paid, and God loves us like He loves His own Son. There is absolutely nothing that we can do that can separate us from His love, (Romans 8:38-39) even if we make the same mistakes over and over again. Becoming a new creation does not necessarily mean an instantaneous transformation from our personalities and habits. It means that we see Jesus, ourselves and other people differently, (II Corinthians 5:16), and because of this we strive to be the people that God wants us to be. (Ephesians 5:1) Our choices are based on different priorities, and we keep doing our best to make the right choices even if it is a challenge. It might take a lot of time and a lot of hard work, but there will come a day when the battles are over, and the creation that God envisioned us to be is complete. The effort will be worth it. Today's post was written by Ron Edmondson. The myth he addresses is prevalent, but the truth is more encouraging. I occasionally like to correct a myth I have heard all my life. How many times has someone said to you, “God will never put more trials on you than you can bear”? I challenge you to show me that in the Bible. The problem I have with this myth is that it keeps so many believers wondering why they can’t handle their problems, falsely believing they should be able to, because someone once told them the lie that God would not put more on them than they could. Yes, we do have the promise that we will not be “tempted beyond what you can bear” (I Corinthians 10:13), but we need to understand what that verse is saying. It says that God will not allow Satan to bring temptation, or enticement to sin, into our life that is too much for us to say no to it. When we are tempted to sin, God will make a way for us to resist it. That is because He wants us to live holy, just as Christ who calls us is holy. Consistently, throughout the Bible, I read where at times God allowed more trials, more pressure, than His children could bear. Elijah, the powerful prophet of God who held back the rain had a time when the trial must have been bigger than his ability to handle it. Consider this verse: “The angel of the LORD came back a second time and touched him and said, “Get up and eat, for the journey is too much for you.” (I Kings 19:7) Once when Paul wrote to the people at Corinth (II Corinthians 1:8), he told them that he and his followers faced trials “far beyond our ability to endure”. David, the great war hero and man after God’s own heart, told the Lord that “troubles without number surround me” and “I cannot see”. He couldn’t see clearly, because he was overwhelmed with the storms of life! Another time David said “Save me, O God, for the waters have come up to my neck.” (Oh how I identify with David there!) Jehoshaphat prayed, “We do not know what to do, but our eyes are on you.” II Chronicles 20:12) It sounds like he was facing more than he could handle on his own. Are there times when God allows more troubles in your life than you can bear? Absolutely! Positively! If you can accept my testimony as an example, let me tell you that sometimes life throws more at me than I can handle, at least more than I can handle alone. The reason God allows you and I to experience times when we are consumed by trials, when they are bigger than our own strength can handle, is so that we have nowhere else to turn, except towards Him. We are faced with one solution, that we realize Christ is our only hope! After Paul wrote that his trial was bigger than his ability to endure, he offers an explanation. “But this happened that we might not rely on ourselves but on God, who raises the dead.” (II Corinthians 1:9) He recognized that this overwhelming time of trouble, that he couldn’t handle alone, had caused him to focus more on the power of God, and allow God to work His perfect will. Are you being challenged beyond your ability to endure? Don’t believe that you can do it alone! You can’t! Jesus said, “apart from me you can do nothing!” (John 15:5) Did you get that point? Nothing! Don’t try anything today without relying on the power of God! He knows you're weak, but He is available to help, if you will call upon Him! When we are at our weakest, He is strong! II Corinthians 5:16-17 tells us that when we accept Christ we become a new creation. That doesn’t mean that we suddenly become perfect; it means that we have a new position as children of God. We still have to work on all the old issues in our lives, but God is a god of second chances. He forgives us for the things that we haven’t got right yet, and He is working on us, helping us to become more like Christ. Verse 17 is a general view of what verse 16 tells us more specifically. Just as we have become a new creation, when we are in Christ we no longer see people according to their human qualities—race, gender, nationality, etc. Now we see them as we are, a person for whom Christ gave His life. God gives us the grace to see that person with spiritual eyes. Before Paul met Christ (and his name was still Saul), he judged Christ on what he had heard about Him. He saw Christ as a contradiction of all the religious laws that he followed so strictly. Then Paul met Christ on the road to Damascus, (Acts 9:1-22) and his views changed. He began to see Christ, and subsequently humans, whether Jews or Gentiles, differently. The world judges you based on your past. God judges you based on your future. The world judges you based on what you have done. God judges you based on what you can, and what He knows you will, become. Let’s do our best to see others through God’s eyes. “My grace is sufficient”, Christ says. Sometimes I repeat this promise over and over to myself. Some days I need it more than others. We find this promise in II Corinthians 12:7-9. The apostle Paul had prayed three times that God would remove a thorn from his flesh. It is never specified what this thorn actually was, whether it was a physical ailment, temptation, opposition from his enemies or anything else. Perhaps it was not specified so that we would feel free to apply the principle to our own thorns. No matter what our trial is, God’s grace is sufficient. According to Paul, the thorn was a tool of Satan to make him suffer, but in the end God used it for good, just as he had with Joseph. (January 31, 2011) God didn’t answer Paul’s prayer the way he had wanted it answered, but God did answer, and He gave Paul something better. Paul was given the power of Christ, the grace of Christ, to endure whatever struggle he was going through. Just because God doesn’t take our suffering away, doesn’t mean that He doesn’t have the power or that He doesn’t care, or that as some think, He doesn’t exist. Sometimes there is a purpose for our suffering, a greater good, even if we can’t always see it. In the garden of Gethsemane, when Jesus was facing death on the cross, He also prayed three times for the Father to spare Him from the pain. But He endured death on the cross because He knew that the Father had a greater purpose. He endured it with joy (Hebrews 12:2), not because He wanted to go through such torture, but because He trusted God to do what was best. In Paul’s case, the constant thorn in his side was a reminder that he couldn’t accomplish his ministry as effectively, if at all, without the power of God working through him. If Paul had been able to do everything in his own strength he would have become arrogant, and I think it’s safe to say that many of the rest of us would as well. Paul’s thorn kept him humble, and it kept him relying on the grace of God. What is God teaching you through your thorns? If you don’t know, ask Him. Instead of complaining about your struggles, ask God what He wants you to learn from them. Ask Him what He will do through you because you have surrendered yourself to Him. By all means, ask Him to take the pain away too, but realize that He might have a reason for leaving you in it.